Shabbat service will be livestreamed on Temple Sinai's website. The Poor People's Campaign rally will immediately follow in the same location at 10:00 AM. Shabbat services and the PPC rally will be livestreamed at www.facebook.com/theRAC. 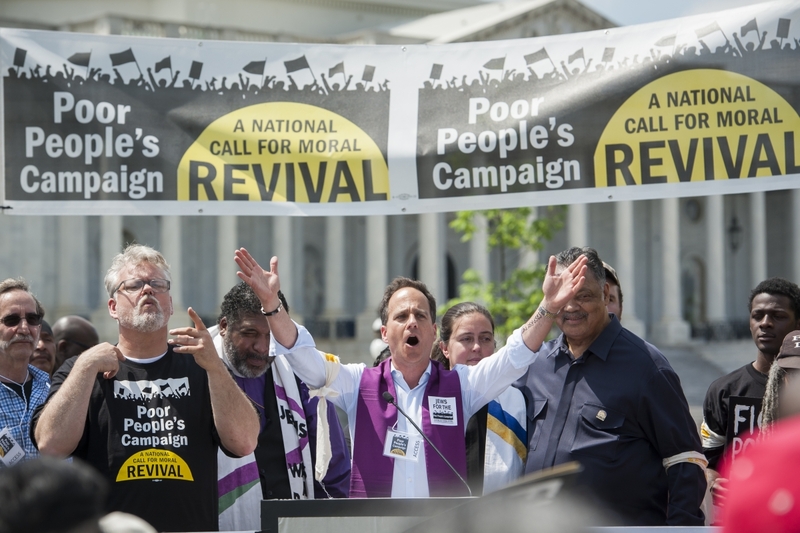 The Poor People’s Campaign (PPC) will unite tens of thousands of people across the country to challenge the evils of systemic racism, poverty, the war economy, ecological devastation and the nation’s distorted morality. This campaign will consist of 40 days, during the months of May and June, of moral non-violent direct action, including a major action on Capitol Hill and in 39 state capitals every Monday. The dates for these actions are May 14, May 21, May 29 (Tuesday after Memorial Day), June 4, June 11, June 18. A call-to-action rally in Washington, DC on June 23. People of faith, as moral leaders, have been asked to come to Washington, DC and/or the state capitals across the country to join with impacted people and other activists in these Monday actions. The participants in each individual action will be given a training on the day of the action (for legal purposes) beginning at 10 AM. Below, please find a series of frequently asked questions and all up-to-date information we have about the campaign. We will post all updates on this page as we receive them. Please check back frequently for additional information. 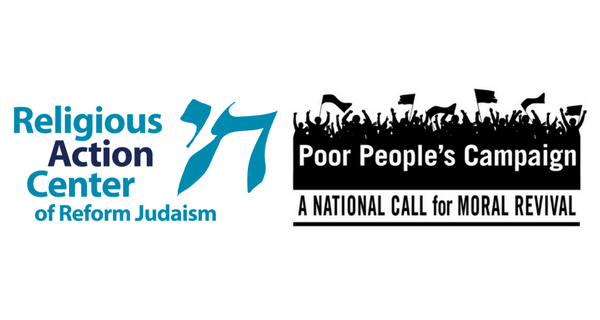 Please fill out this form to join with other members of the Jewish community for the Poor People's Campaign 40 days of Moral Action. There are two possible ways to engage—as part of the moral non-violent direct action and act of civil disobedience, or in a support role. Please complete this form to let the RAC know you are participating. What will a Monday day of action in Washington, DC look like? For those participating in civil disobedience and risking arrest: these Mondays of action will begin at 10 AM with a training with all the legal and logistical information you need to know. For June 18, the training will take place in the Campaign's tent, on the national mall at the corner of 9th St and Jefferson St SW. There will not be a nonviolent direct action on Saturday, June 23. At about 1:30 PM the group will go together to a rally in front of the capital building. The rally will include those not participating in civil disobedience and will begin at about 2 PM with speakers and supporters, then the civil disobedience action will begin at about 3 PM. Those being arrested in DC will have to pay their fines in person in DC no sooner than 5 PM on the day following your arrest and within 15 days of the arrest. If you are traveling to D.C. from outside the area, plan your travel to allow time for paying your fine after 5 PM on the day following your arrest or plan to return to Washington D.C within 15 days. For those NOT participating in civil disobedience: If you would like to play a role like jail support or serving as a marshal, you need to attend the 10 AM training at St Mark’s Episcopal Church and follow the above instructions. If you would like to come as a witness or supporter, you can meet with other members of the Jewish community at 1:45 PM at the bottom of the steps of the Supreme Court to walk over to the rally together. There will be a staff member to meet you there holding a "March Proudly" sign. The action will commence at about 3 PM. The day should end Monday late afternoon. Who will be with me at the Monday actions in Washington, DC? Jewish leaders will come to DC for each one of these Monday actions. There will also be some members of the RAC staff accompanying those who choose to attend the action. If you want to join us please fill out this form so we can get in touch with you. What will a Monday day of action in a state capital look like? Each state organizing group will be planning the details of the local events. Please be in touch with your state group for additional details (contact information below). We have been asked to come dressed conspicuously in religious attire. The weather will likely be hot and humid, but we want to be sure to dress respectfully and keep in mind that photos of these actions will be taken and shared in social media and the press. If you would like to wear tallit or kippot, we encourage you to do so. You’ll be representing the Reform Movement and Jews across the country. Do so with pride! If have to travel, where will we be sleeping? Do I have to book a hotel? If you are traveling to Washington, DC or a state capital from a distance and will be staying overnight, you should plan to book a hotel for yourself. In order to maintain control of the message and events, the exact location of each week's action will not be announced publicly, but they are most likely taking place on or near Capitol Hill. We recommend booking hotels either near Capitol Hill or near a Metro stop that will allow you to make it easily to and from the Capital Hill area. Meals will not be provided by the Poor People's Campaign; you should plan accordingly and bring snacks. "If your neighbor becomes poor, then you shall strengthen him"